Australian TV soap was in full swing by the turn of the eighties. It was just about mandatory for each commercial network to have at least two hit soaps in its prime time schedules. Aussie soaps like Prisoner and The Sullivans were still doing big business overseas, but the new trend overseas was glitz and glamour with shows like Dynasty and Dallas. Despite some Australian attempts to copy the formula, in the mid-Eighties it took an evening soap set in middle suburban Melbourne to once again put Australian TV on the world map. Ten took the unusual path of producing this in-house, and without a pilot episode to begin with. A fortune was spent in converting the studios into a replica shopping mall. The results were tragic and Ten’s big-budget new series for the decade was axed after six weeks on-air. Set around a tropical holiday complex but filmed on location around a mock holiday resort constructed outside Ten’s Melbourne studios, during winter. The audience wasn’t fooled and production was axed after six months. A male equivalent of Prisoner, but was never as popular. Included in the cast list was a young Mel Gibson. For over a thousand episodes, viewers followed the lives of the residents of rural Wandin Valley with most of the drama centred around the local hospital. Things weren’t so rosy when Ten took on the series and changed the setting and most of the characters. The blossoming romance between John and Angela was stopped short when it was discovered they were long-lost brother and sister! A huge hit for Seven, initially screening five nights a week, and scoring a Gold Logie for Rowena Wallace in 1985. 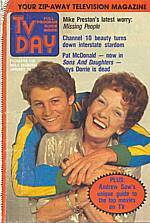 Australia’s answer to the big-budget US soaps Dynasty and Dallas was not a huge success. Launched as a replacement for the recently-axed The Young Doctors, the cast of Nine’s ill-fated university drama included newcomers Peter O’Brien, Nikki Coghill and Tottie Goldsmith. Another police soap/drama, taking a similar tone to Cop Shop, but with a younger cast, and this time coming out of Sydney. Crawfords’ story of life in Melbourne in the 1920s featuring former The Sullivans star Lorraine Bayly. The short-lived tale of a Sydney working-class family featured Ed Deveraux (Skippy The Bush Kangaroo), Melissa Jaffer (GP) and Deborra-Lee Furness. Produced by Grundy Productions, this was another in Nine’s string of ill-fated soaps, although the cast did feature Anne Charleston who went on to become a favourite in Neighbours. This glitzy series was the spin-off from the popular 1983 mini-series of the same name. Featuring Rebecca Gilling, James Smillie and Peta Toppano in a tale of big business,… and big hair. A minor success in Australia — it was never renewed beyond the initial 26 episodes — but sold well overseas. From the producers of the popular The Box, Prime Time again took viewers behind the scenes of a television station — but this time put the focus onto a fictional television station’s current affairs program. Sydney’s answer to Neighbours was set in a semi-rural community. Despite promising ratings and a strong cast — including Gwen Plumb (The Young Doctors), Paula Duncan (Number 96, Cop Shop, Prisoner) and Maggie Kirkpatrick (Prisoner) — Network Ten axed it after one season. Regretting the loss of Neighbours to Ten, Seven fought back with this in-house production. Like Neighbours, it has become an international hit and is still going strong in Australia after almost 25 years. The semi-rural setting of Richmond Hill was replaced by the tale of life in a fictional inner-suburb, Westside. Former A Country Practice star Penny Cook was E Street‘s leading lady, as Dr Ellie Fielding. E Street managed to mix suburban drama with grisly storylines not seen since Number 96, including serial-killer Mr Bad (Vince Martin) and a bomb-blast that wiped out three long-serving characters. Yet another daytime soap attempt — again from Seven. Dismal ratings (up against Nine’s popular variety show Midday) saw this series axed within its first year but not before launching the acting career of a young Julian McMahon.